In 1968, Sylvia and Gerry Anderson, creators of the puppet and scale model based sci-fi television series’ Fireball XL5, Stingray, and Thunderbirds, released a new series titled Captain Scarlet and the Mysterons. 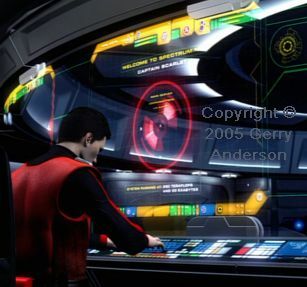 Nearly 40 years later, Gerry Anderson (he and Sylvia had parted company) led a team that created New Captain Scarlet, a computer-generated version. It consists of two series’, each containing 13 episodes. 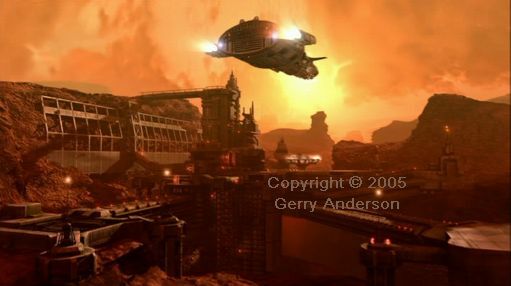 This article reviews Gerry Anderson’s New Captain Scarlet. 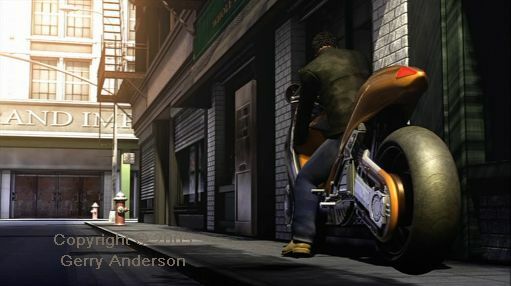 In terms of visual realism, the people are not 100 percent realistic, but they are, in my estimation, life-like enough so you forget that they are computer-generated. Conrad Lefkon (Captain Black) is not the sinister cardboard cut-out character of the original 1968 puppet series. Now he is cynical, to be sure, but whimsical and soft-spoken. Who wants the world? Conrad Lefkon (Captain Black) does! Like the puppet-based original, crowds are a problem apparently even in CGI (or maybe they just wanted the same depopulated feel of the original). 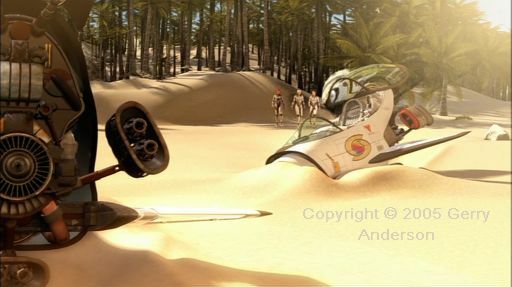 Therefore, much of the action takes place in deserts, on Mars, the highlands of Scotland, and other sparsely populated areas. Spectrum, a United Nations ‘super military’ force, is the organisation to which the captains and most other personnel of the series belong. 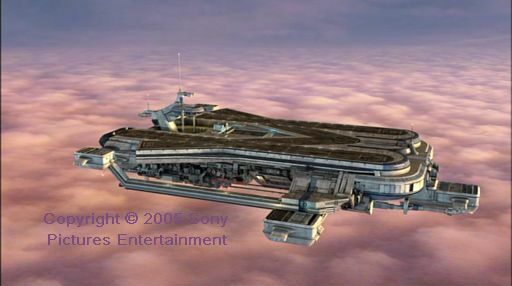 Its headquarters is Skybase, an airborne aircraft carrier that cruises in the thin air at 60 000 feet. It carries not just aircraft, but a variety of interesting vehicles. For example, raid bikes are motorcycles with accessories that enable them to be deployed from Skybase. Warning: Not to be used when Skybase is over an ocean, a rain forest, or anywhere devoid of long straight roads! I wondered how they keep the Skybase hangar deck pressurised when the aircraft elevators are in operation. In a couple of scenes there is just a glimpse of the ceiling/sealing of the pressurized hangar deck. The mechanism is not shown, but clearly the elevator’s upper section constitutes a huge air lock. On which subject, the fastest elevator I ever experienced was that of the Post Office (Telecom) tower in London. Similarly, when this derivative of the Boeing V-22 is let go, here over cloudy Scotland in episode 11, if your stomach does not feel like it is left behind at Skybase, you ain’t no pilot at all. Episode 3 of series 2 also includes a launch of this craft and it shows the air lock functionality of its launch bay. 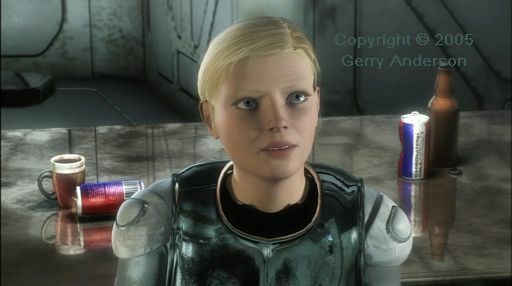 This shot of Destiny is about as much bare skin as you get to see in New Captain Scarlet. 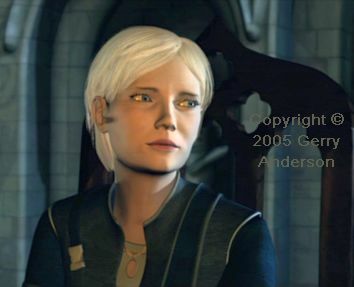 The disharmony in episode 11 between accident prone Mitch Johnson and Rebecca Drake (Harmony) culminates in Rebecca out-thinking the Mysterons. However, the Mysterons, it turns out, have already out-thought her. The plots of these stories are fairly easy to follow (luckily for me) but they have enough depth to make them seem plausible. In the 20th century, heroes were pilots, everyone else was supporting cast. That was true of film and of real life. (Before the 20th century, you had to be a steam engine driver and before that – for millennia – you rode a horse.) Then in the 1960s, some miserable pudknockers in a research lab somewhere announced that women were more physically suited to flying than men. The finding was, like the spaceship that landed in the middle of a cricket match in The Hitch Hiker’s Guide to the Galaxy, too hard to handle and was simply ignored. Except by Sylvia and Gerry Anderson, creators of the puppet and scale model based sci-fi television series’ Fireball XL5, Stingray, and Thunderbirds. They then created a series in which the pilots of jet fighters were all women. That series was titled Captain Scarlet and the Mysterons. In Captain Scarlet and the Mysterons, the male heroes were ground pounders. The female fighter pilots were supporting cast. You cannot get more subversive than that! It seems to me that, rather than an attempt at social engineering, where you were now allowed to be a hero without being a jet fighter pilot (the advent of hang gliding just a few years later achieved that) the Andersons more likely saw it as an opportunity to appeal to a wider television audience. The hardware in these shows was also a centrepiece. 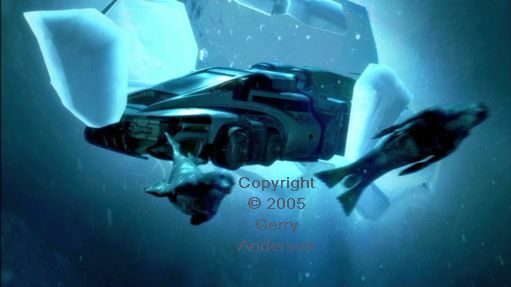 Unlike its predecessors, with the advent of Captain Scarlet and the Mysterons, instead of marvelling at flying machines, spacecraft, and submersible aircraft (you think Stingray looks like a submarine?) you could critically appraise a variety of ground-based machines. The sort of thing the man in the street could aspire to drive – when the real thing came out in, oh, say five years or so. 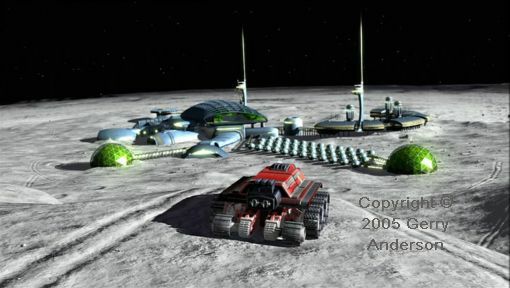 The Captain Scarlet story is one of war between two civilisations. Its basic plot is as old as the first broadcast science fiction. However, unlike HG Wells’ The War of the Worlds, in which the Martians are unreasoning malevolent invaders, here we find that the Mysterons have points in their favour. Skybase, an aircraft carrier in the sky, is not a new idea. It has been done for real. During the first world war (1914 to 1918) British airships carried fighters experimentally. Similar experiments were carried out in the USA in subsequent years. 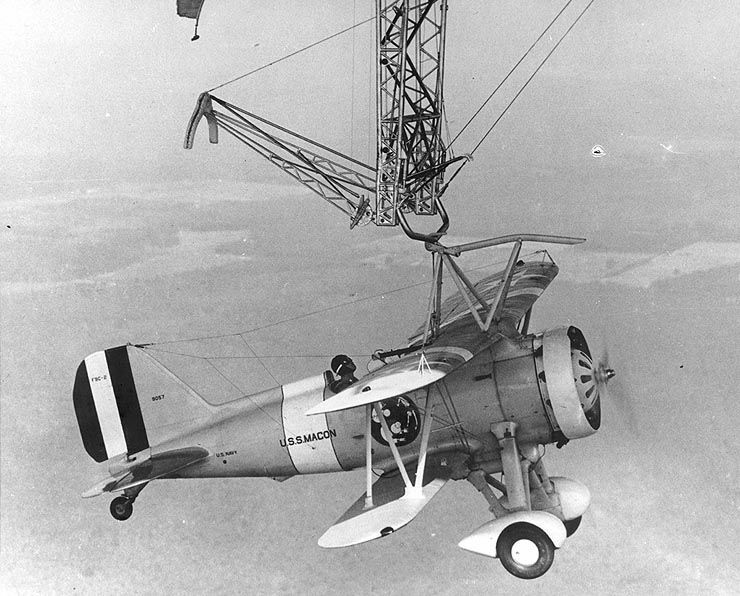 Curtiss F9C fighter attached to the helium-filled airship USS Macon in 1930. Wikipedia image. Fantasy island: The Falcon escape pods are exquisitely designed. 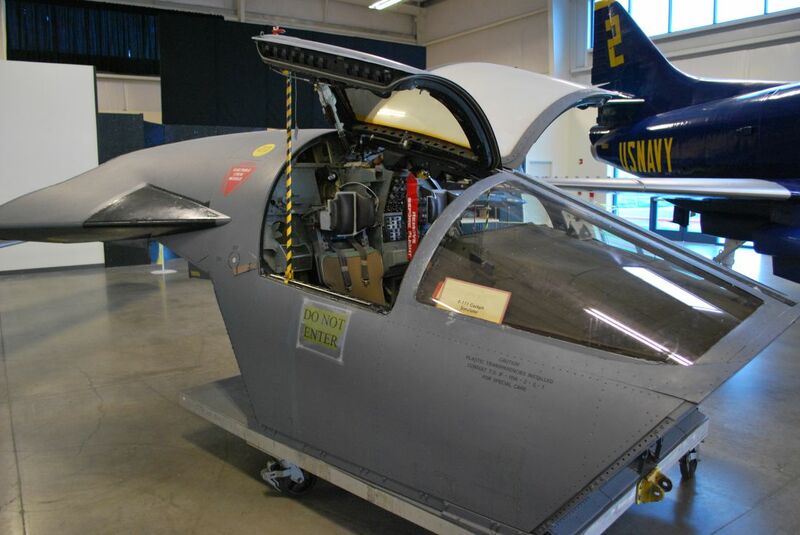 The escape pods of the Falcon jet fighters combine the functionality of the Vietnam War era F-111 escape capsule with canard foreplanes and a tiny jet engine to extend the pilot’s escape and evasion prospects. During the 1960s, NASA tested a variety of craft with the same aim in mind. For examples, see my page Space flight and hang gliding (linked farther down). F-111 escape capsule. Wikipedia photo. However, unlike the F-111, which did not have ejection seats, the Falcon escape pod comes with an ejector seat to use when the pod is itself shot down! 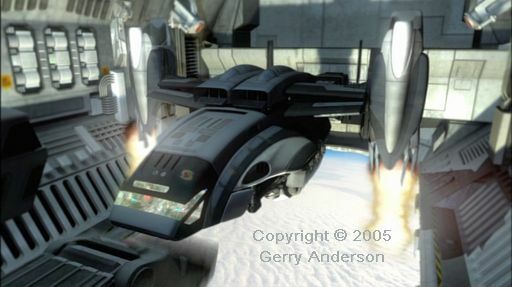 The Mercury space shuttle in episode 6 is launched on a rail like Fireball XL5, one of Sylvia and Gerry Anderson’s early puppet based sci-fi creations. It was likely inspired by the V-1 flying bomb launch rail system of World War 2. The Angels, as the pilots of the all-women fighter squadron based on Skybase are collectively known, fly Falcons. 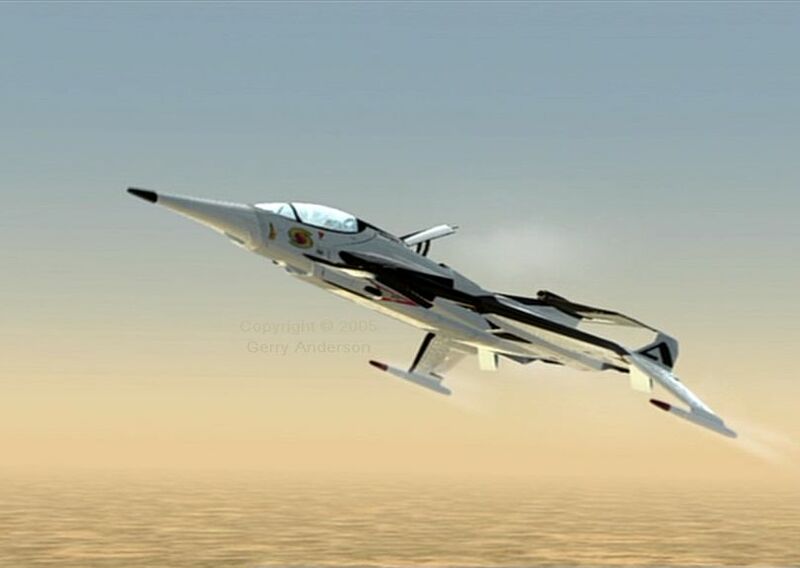 Finished in United Nations white with black leading edges, these canard configured jet fighters are both more advanced and more carefully thought out than the Angel Interceptors (MiG 241s) of the 1960s puppet series. Skybase inhabits the upper atmosphere at 60 000 feet, so you cannot venture out on deck without a pressure suit. The catapult officer, safely insulated from the near vacuum outside, observes the flight deck via monitors and is himself observed by the kind of motion sensors used in the making of New Captain Scarlet (see Extras). 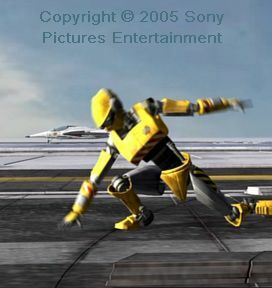 Meanwhile, at any given moment, a selected android on the deck mimics his movements and launches a jet fighter. Episode 3 of series 2, titled Enigma, has fairly comprehensive Falcon action including refuelling and rearming. — Sir Charles Grey (not to be confused with Captain Grey) in episode 3 of series 2. 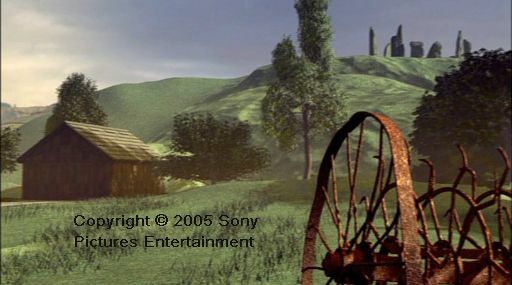 Sir Charles is one of the main characters in the series, all of whom have ‘real’ (fictional) names in addition to being voiced by real actors. 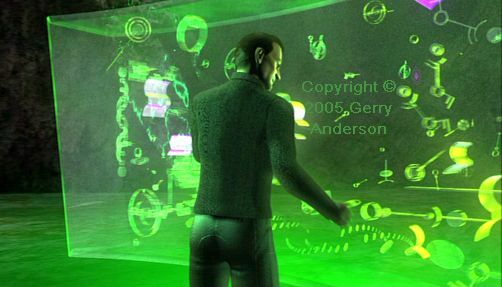 In this screenshot, the Mysteronized Conrad Lefkon (Captain Black) controls crop circles – a side effect of more serious interference with the ecosphere — from an underground bunker. However, things are not proceeding according to his and the Mysterons’ plan, which relies on disabling digital processing and communications. 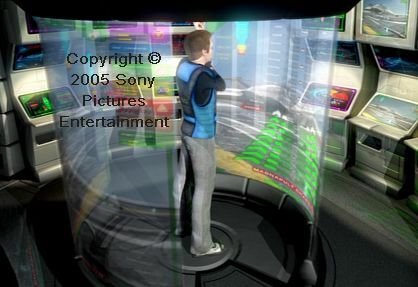 The sometimes multiple reflections in this high-tech world of Plexiglas and computer displays are convincingly rendered. 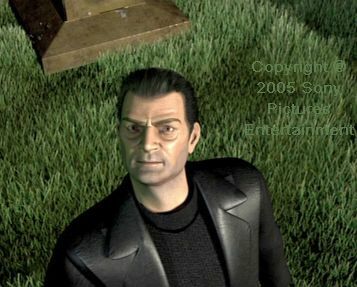 A prominent character in the series, surrounded by the trappings of private wealth (in episode 12) is confronted with the dilemma of choosing between his duty to society and saving his daughter from danger. I mention that as evidence for this series’ depth of storytelling. A computer in this building on the coast of Andalucía, in which resides a member of the United Nations Security Council, is infected by a virus. It is no ordinary computer virus. In this screenshot, Colonel White is about to move to his right (your left). As he does so, Captain Indigo (John Roach) raises his weapon as a safety measure. This series has better ‘acting’ than most major war movies, in which firearms are carried without regard to safety. While preparing to lift off from the surface of Mars at the end of episode 7 of series 2, Scarlet voices his opinion that human corporate greed is worse than the Mysterons. Here, Destiny is annoyed at the reappearance of a former lover. The series includes occasional brief wildlife scenes. Episode 4 of series 2 features a pretty good Aurora Borealis. 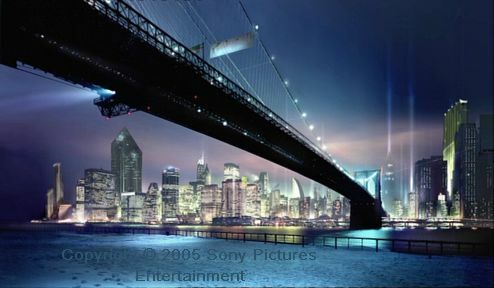 This New York side street will be familiar by the time you get to this episode of series 2. 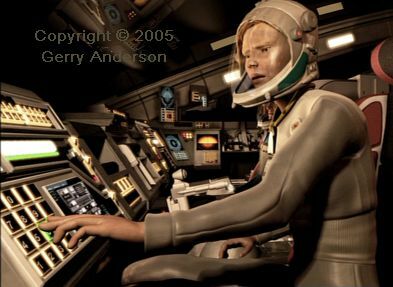 As an example of the attention to detail in the series, the Lunar vacation brochure in this screenshot has animated cover images. 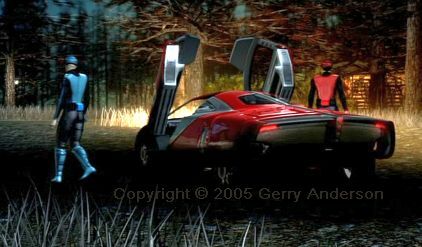 (That is, animated within the New Captain Scarlet animation.) This scene, in which Destiny is packing for a holiday is so short, just a few seconds, you might not notice that detail. The navy expression for acknowledging an order “Aye aye” and its army/air force equivalent “Yessir” is replaced in New Captain Scarlet by “Spectrum is green,” often abbreviated to “S.I.G.” It is, I suppose, marginally less cringe-worthy than “That’s F.A.B. Scotty” in Thunderbirds. While the motions of the ground vehicles seems realistic to me, that of the flying machines is not so good, although it improves in the second series. For example, when lifting off either from a regular runway or from a Skybase catapult, the moment the aircraft pitches nose-up, it leaves the deck. Aircraft are heavy, so the imparting of the upward velocity takes time. A good example to watch is an F-14 carrier launch, of which many videos are available online (or watch Top Gun). The aircraft pitches nose-high, but continues straight on while the lift (and induced drag) vortex forms. Then the wings flex and start to accelerate the aircraft skywards. 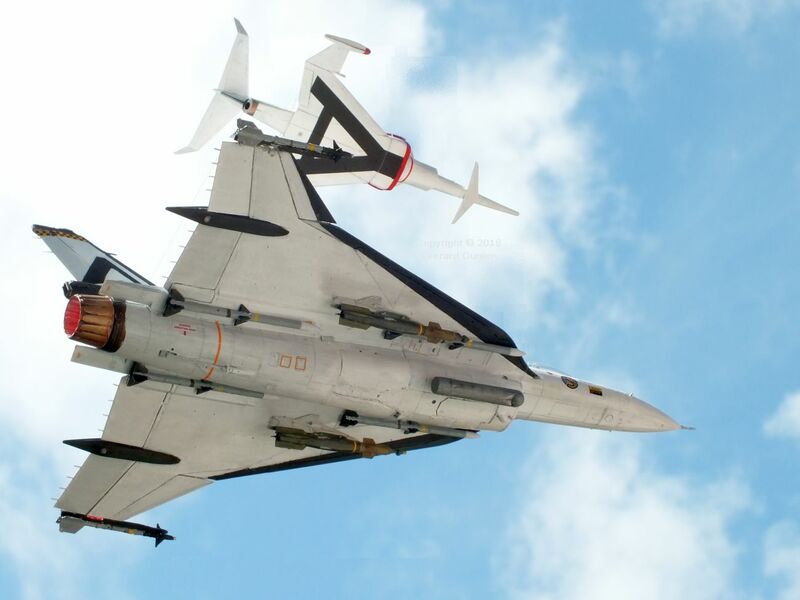 That shortcoming is a shame because a great deal of effort has been expended in making the aircraft appear realistic and, in terms of their moving parts, act realistically. Some understanding of flight is clearly necessary when depicting flight. 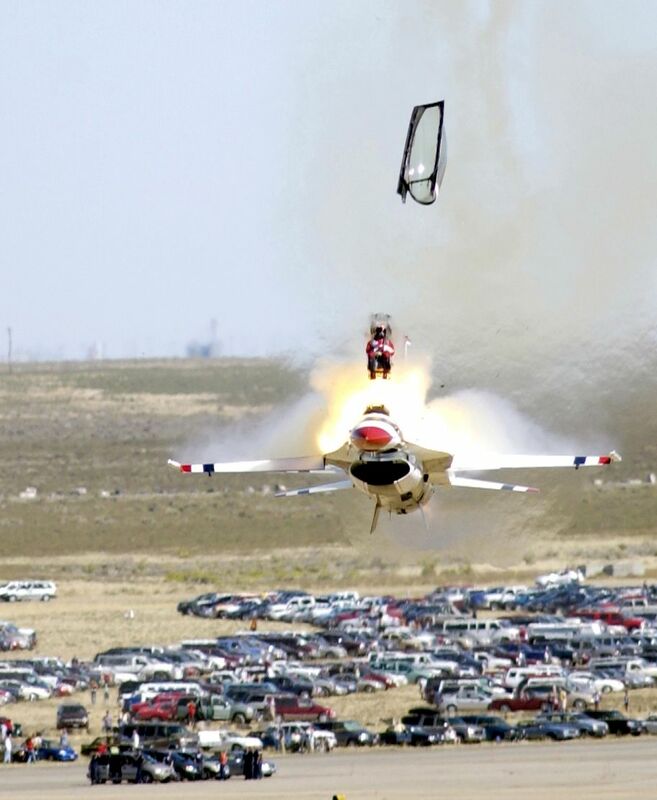 2003 Thunderbirds Falcon crash. U.S. Air Force photo by Staff Sgt. Bennie J. Davis III. The accompanying photo is of a Thunderbirds display team F-16 Falcon less than a second before it struck the ground at an air show in 2003. It is in a nose high attitude, but it was certainly not climbing at that moment! And they have no concept of how a square parachute works. An opportunity for some great flying action is lost. In this screenshot, Caroline (Rhapsody Angel) adjusts her aileron differential, likely to minimise adverse yaw at transonic airspeeds, while Destiny looks on. Sometimes the port outer leading edges of the Falcons are black, as here in episode 2 of series 2, and other times they are white – as though subject to hasty replacement with no time to go to the paint shop before being fitted. However, they all conform! Usually. While the motions of the lunar rovers in episode 10 of series 2 look right to my eyes, I feel that the dust they kick up falls to the surface too quickly for one-sixth Earth gravity. In addition, where are the wheel marks of the rover in the screenshot? It does seem strange that battles between Earth’s most advanced military organisation in 2068 and a Martian entity so advanced that it can replicate people or entire cities in seconds, so often end up with a fist fight between a guy in black and a guy in red. Lastly, the main thing I notice about the characters’ faces is that their teeth are too white! What this Skybase at dusk screenshot fails to show are the ‘moving lights’ of the approach lighting system. Just another visual detail in this spectacular series. 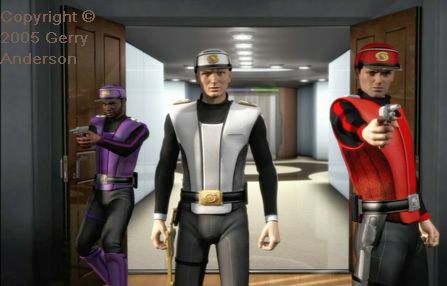 Although watchable by youngsters, New Captain Scarlet is serious grown up entertainment. It is one of the best visual productions I have ever seen. It takes you to Mars, New York, a Pacific island, and Alaska, to name a handful of settings, and you join a biker gang in the Arizona desert. The stories are simple enough for anyone to follow, yet, like the scenery and action, always different enough to be interesting. Captain Ochre isn’t bad either. She comes with a great Irish accent. 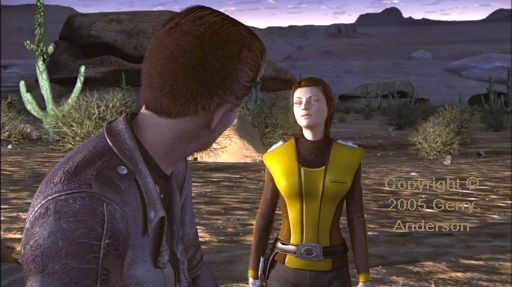 Incidentally, the Captain Ochre of later episodes is not the same individual as in the first episode. Follow-up productions often disappoint, but series 2 of New Captain Scarlet is even better than the first series. The DVD ‘box set’ comes with some extras that include alternative sound tracks with commentary by the makers and voice actors. In live action motion capture, sensors all over the actors’ bodies record their motions and postures. 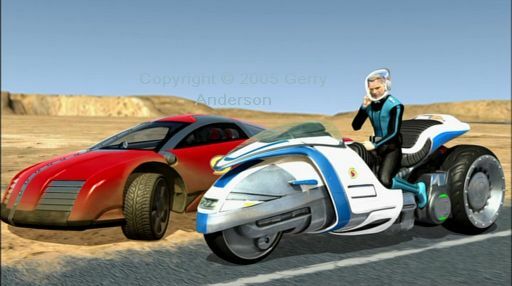 By computer processing, the real actors become CGI renderings and the real motorcycle becomes a three-wheel raid bike, albeit retaining some Yamaha DNA. 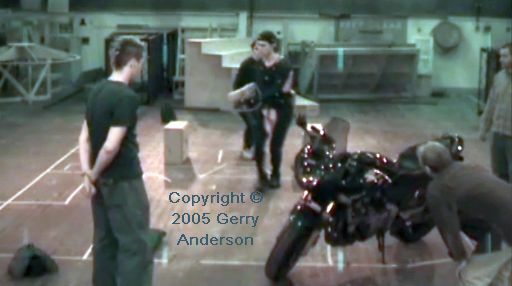 Later, you see the crouching guy on the right moving around in amongst the actors while they are doing their thing. They are not being filmed, remember (well, except incidentally for the info video from which this still is copied) so he is not interfering with the view. He is taking the opportunity to gauge the best virtual camera position. 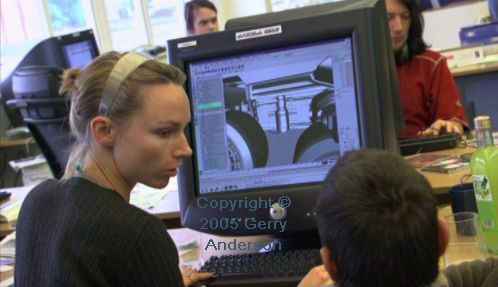 As with flight simulation computer programs, the virtual camera can be anywhere you like. 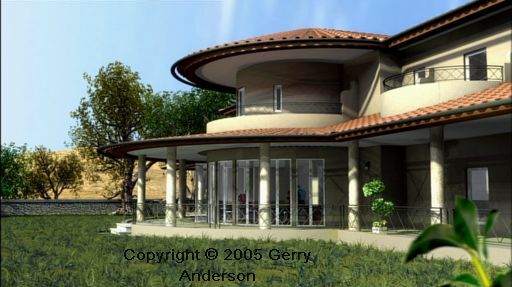 Just specify a series of coordinates and associated timings and the computer program computes what surfaces can and cannot be seen from that viewpoint, looks up the colours and textures of the features that can be seen, and draws the images as seen from that perspective – all in less than the flicker of your eyelid. Boeing V-22 Wikipedia entry. The Spectrum Albatross tactical transport VTOL aircraft is clearly based on the V-22 Osprey.